As told by Pat Barrett: This is the first car built by the team of Pat Barrett, Mike Malone and Charles Brumfield. This picture was taken before the numbers was painted and the motor was installed. 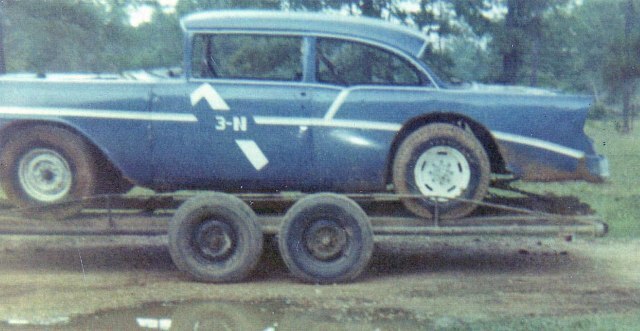 The number 3N1 was chosen because of the 3 owners/drivers in 1 car. It first raced at Carson Speedway. Other drivers to take the wheel were Johnny Boe as well as Dave Fancher. The original motor in the car was purchased from Ben Adams. The car was re-bodied with a 1955 Chevy, painted orange and numbered 66jr.